This is my first food post from Sydney. However, its not the first thing I cooked here, if it were, it would've been an awesome coincidence. Up until now, I've been sharing a few recipes with you that we made when I was in Mumbai, but didn't have the time to put up. There still are a couple more, but I'll probably save those for a rainy day. There's so much wonderful produce available here, its really hard to decide on what to pick up. For this months SRC assignment, I got to go through the very delicious blog, Crumb, authored by Isabelle, a girl after my own heart. It seems like we have a lot in common and I know we'd probably have been best buds if we knew each other in person. I've visited this blog for a while now, and each time drooled over the amazing posts I saw there. If you haven't been there yet, you have to head over now and say hi to Isabelle. I cannot tell you how difficult it was to choose a recipe for this months reveal. There was so much baked goodness, I was more than a little upset that I don't have an oven at my disposal. But I know I'll head back to Crumb ever so often. I spent many days looking through the wonderful fare Isabelle dishes out every single time and when I saw her post on Chorizo hash, I know I had found the one. I love Chorizo. In the past I've posted the Goan - Portuguese version of a spicy chorizo chilly fry. Every true Goan loves these sausages in one form or another. Haven't seen it, head over here. This post on a very humble Goan delicacy has been extremely popular, to my astonishment. This post was so meant to be. I happened to pick up a bunch of Chorizo sausages even before our assignments were sent out this month. We enjoyed our Goan take on the sausage and had some sausages to spare. So when I decided on this recipe, it was very convenient. I had everything on hand and was sitting down to a delicious weeknight meal within no time at all. Delicious, atleast I think so. This was my first time playing around with Picasa photo editing and am still getting the hang of it, so please bear wit me while I get into the swing of things. Do you have any tips of using Picasa? I'd love to hear from you, leave me a comment and tell me what I can do to better my skills. 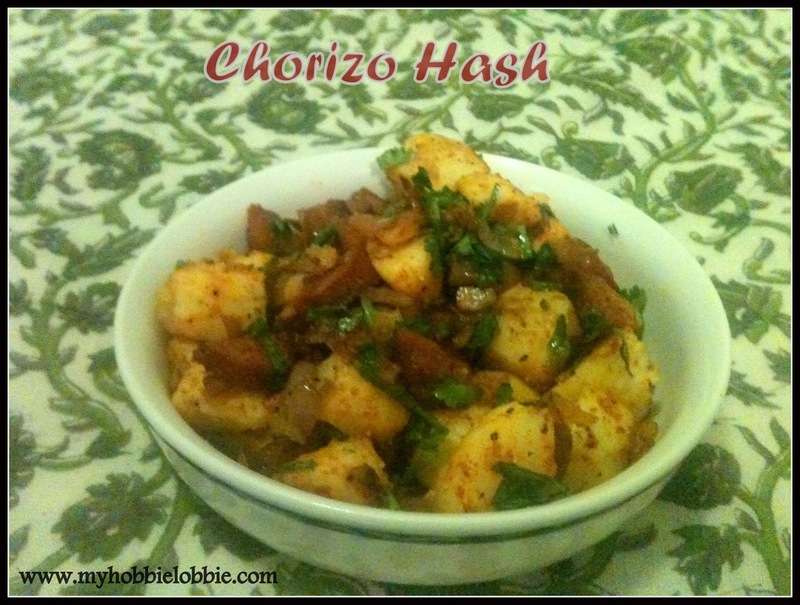 Back to the reveal, here's how to put together a quick delicious bowl of Chorizo Hash. Thanks Isabelle, for sharing a wonderful recipe. Heat oil in a pan and fry off the chorizo for a couple of minutes, till it starts lightly browning. Stir in the onion and the potato and continue cooking for about another 8-10 minutes, stirring occasionally. By now the potatoes will have turned golden and crispy. This is what we are looking for. Sprinkle the chilly powder over and season to taste with salt and lots of freshly crushed pepper and stir well to mix. Just before serving, sprinkle the chopped coriander over and lightly mix. That deliciously spicy dish of yours would make my tastebuds sing. Thanks Sarah, we love it too! Isabelle's blog is amazing, isn't it?! I still have been assigned to her yet...in the SRC. Soon, I hope. But this looks delicious. Thanks for sharing! Hi there. We love chorizo in this house and would so enjoy a bowl. I switched from picassa to pic monkey and like it so much better. Have you heard of pic monkey? No, I haven't but I'd love to check it out. Thanks for stopping by Angela. :) Chorizo makes us very happy too! Love chorizo so these potatoes are right up my alley! YUM!!! Thanks Kate, I hope you get to try it out soon! i love anything with chorizo, and once made chorizo potato tacos so i know we'd love this!! I've gotta try those tacos, do you have a post on them? I use Picasa, but the only editing I do of my photos is adding the title and my blog name. This sounds like a really tasty dish. Great choice! Thats pretty much all I'm looking at doing too Lesa :) Thanks for stopping by Lesa! My family would love this hash. You've moved to Sydney? I'm behind the times. No, I'm not going to be able to do the 12 Weeks of Christmas Treats this year. :( I'll still try to check out everyone's posts as often as I can though. Thank Katrina, Yeah, we moved about 2 months ago. You will be missed at the 12 Weeks party for sure, I love the stuff you put up in the past editions. Welcome to Australia Trisha! This looks delicious - gotta love chorizo! Lovely and mouthwatering chorizo. Wonderfully prepared.